In the left side of the image, it is visible a satellite of Saturn. It is Titan, with 9 magnitude. Over it, a bit at right there is almost visible another one, Rhea of magnitude 10. 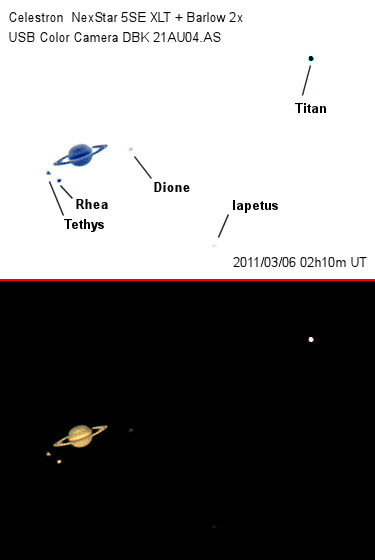 Visually it was observable another one aligned to Titan and Rhea, but it is not visible in the image. It was Dione with 11 magnitude. Luckily this image shows the gap between foreside ring and its rear part. The image effective resolution according to my calculations is 1 arcsecond. Two cloud bands are visible one in the north hemisphere and the other in the south. 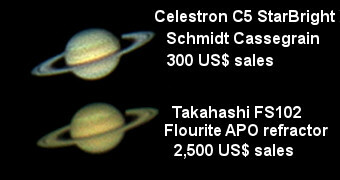 I would like to break the 1 arcsecond resolution barrier, but I don’t know if it is possible with this telescope. Theoretically it delivers a 0.3 arcsecond resolution because it has 400mm of mirror diameter. 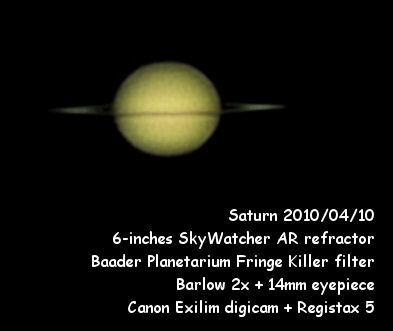 Saturn is getting hard to be photographed. I have recently bought a low-quality barlow 2x and a ScopeTronix EZ-Pix II. The clouds aren’t giving me many opportunities to see Saturn, but I could find a hole in the sky 2 nights ago. I took a time trying to collimate the dobsonian as better as possible. Nevertheless I couldn’t get a sharp focus. I took video and single frames. After stacking with Registax 5, I have got this image.